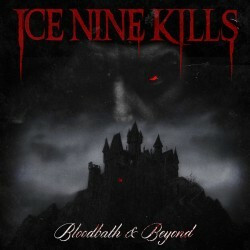 I was introduced to Ice Nine Kills when I saw them earlier this year on tour with Motionless in White. We ran into their vocalist, Spencer, backstage and to this date he was one of the coolest and most hilarious people we’ve met to this date. After talking to him we had to go check them out and see what they were all about, and WOW did they bring it. I’ve been hooked and a fan ever since that night. When I recently caught news that they have a new album dropping late this year I was definitely excited. We are just under 2 months from the release of their new album, Every Trick in the Book. which is due out December 4th 2015. The band has decided to tease us all a little bit by releasing what is technically the 2nd single off their new album, a track titled Bloodbath & Beyond. Reading that title and also hearing how this album was based on famous literature I figured we were in for something special. One thing that grabbed me at first about Ice Nine Kills was their ability to mix the really melodic clean vocals with the harsh brutal screams. Bloodbath & Beyond has a perfect blend of both. It starts off nice and mellow and before you know you;re whipped into a frenzy and ready to mosh! This song is a tale of Dracula, with my personal favorite line “The Prince of Darkness? F*ck That I’m the King!” This song is up there with some of the heavier songs in the bands catalog. If this song is an example of what we are to expect from their upcoming release, then we will have a definite contender for album of the year. They are hitting the road this fall to gear up for the album release as well as celebrate their arrival to Fearless Records. If they come to your town it’s certainly worth the price of admission, don’t miss out on them!